Check out the action in the lower left corner. Bubbles! The bubbles are great! In fact, there are a lot of funny details all over the place. A great diorama! Is that guy in the upper left being tickled to death by monkeys? Nice! That wizard hat is *genius*. The, uh, baby has sort of a, uh, mustache. My only wish is that there were more close shots posted in the gallery. Jeesh people, we get spoiled with photos on other posts and now look at me, I need close-ups!! 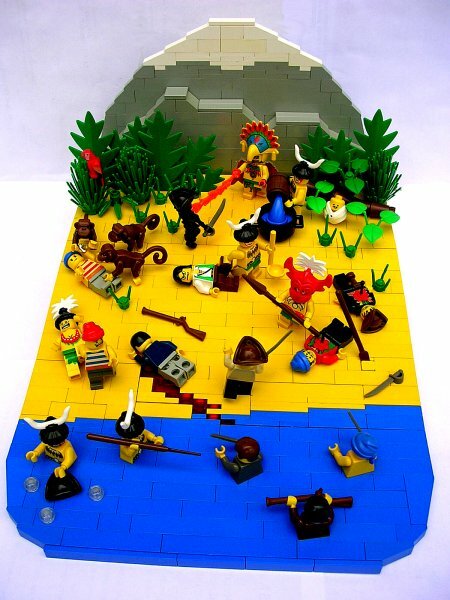 Now, THIS would make an awesome brickfilm.